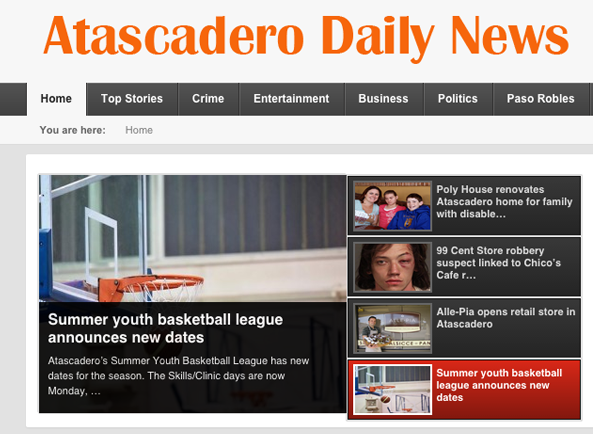 Access Publishing officially announced this week the launch of the Atascadero Daily News. This new website will provide readers with Atascadero news including original stories and reports from local news sources. Local staff writers will be creating original content for the site, and the site will also publish press releases from local groups, organizations and other sources. Access Publishing CEO and Publisher Scott Brennan says he decided to start the new website after experiencing tremendous success with the company’s news site, the Paso Robles Daily News. “We started the Paso Robles Daily News to fill a void in online local news coverage. The response was hugely positive. Many Atascadero residents came to us saying that they loved the Paso Robles Daily News and wished we had similar website for Atascadero,” Brennan says. Top stories for the site will include crime, politics, business, entertainment and regional stories. Breaking news and top stories will also be featured on the website’s Facebook page. To subscribe for free, go to atowndailynews.com/subscribe/.